Detail. Door moldings and brackets from William Halfpenny’s “Practical Architecture” (1724). Moldings frame the spaces in which we live. Ceiling cornices, window frames, door lintels, wainscot, and baseboards have all traditionally relied on the elegant shapes and ornamental details of moldings to be made richer in scale with a more vibrant visual effect. They have done so since humans first created buildings for shelter and then turned them into a form of high art. The ancient Greeks perfected the use of moldings in the adornment of their temples. High atop the Acropolis of Athens, the Parthenon (438 BC) sits in all of its majesty as one of the finest examples of classical architecture in western civilization. Its soaring columns are topped by an entablature precisely marked by a series of moldings. These beautifully delineated devices draw the eye upwards to the triangular pediment of the roof that encased fine sculptures. 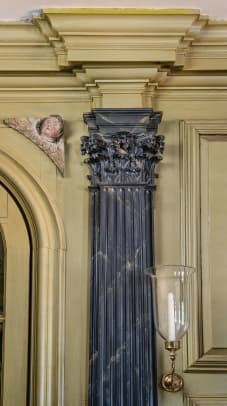 While columns and statuary were the stars of the show, the simple moldings can aptly be called the humble servants. They have the critical task of framing the main features of the building. The two types of molding developed by the Greeks, and still in use today, are the cyma recta, with an outward S shaped curve, and the cyma reversa, with an inward S curve. These were used primarily under the main gables of a temple roofline while rounded moldings, such as the astragal, appeared on the flat surfaces. While not intended to detract from other aspects of the building, moldings did receive their fair share of decoration. A system of ornament appropriate to the shape of each molding provided a methodical way to embellish buildings. 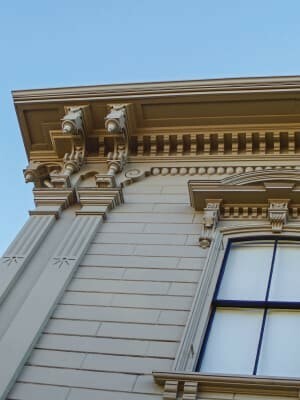 For example, tooth-like details called “dentils” were used on flat surfaces. Oval shaped of “egg and dart” motifs were suitable to rounded ovolo moldings while the horizontal emphasis of bead and reel decoration sat comfortably on thin, narrow moldings. Armed with these techniques, the Greeks perfected their version of an ideal architecture. Classical Greek molding and ornament in cast and glazed terra cotta. Bead and real appear on the lower part of the arch, egg and dart on the upper part of the arch. Bead and reel adorn the moldings of the cornice (top of photo). Rosecliff (1902). Newport, RI. The ancient Romans inherited Greek moldings but they used them in more innovative ways. On the Altar of Peace (13 BC), commissioned by Augustus Caesar, the moldings are layered along the top of the structure in an exaggerated manner to create visual drama. Even with the fall of Rome, the use of moldings would survive and thrive through the ages. Medieval builders accentuated the sweeping vaults of their Gothic cathedrals with rounded “ribs” that focused attention upwards to the ceiling and heaven itself. 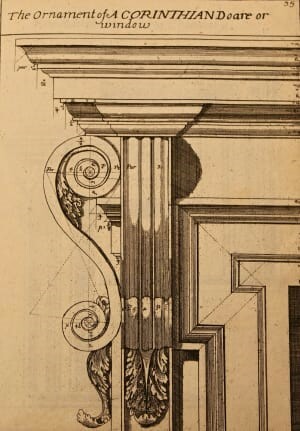 Greco-Roman moldings were revived during the Italian Renaissance of the 1400s and subjected to intense scrutiny as pattern books were illustrated to provide exact measurements of these features. Understanding that classical design was based on harmonious proportions, Renaissance architects began with the use of moldings as basic units of proportion. This practice continued through the centuries as the foundation of traditional building. Italianate House, Salem, Ma. circa 1870. The invention of the saw revolutionized the production of architectural details in the mid 19th century. 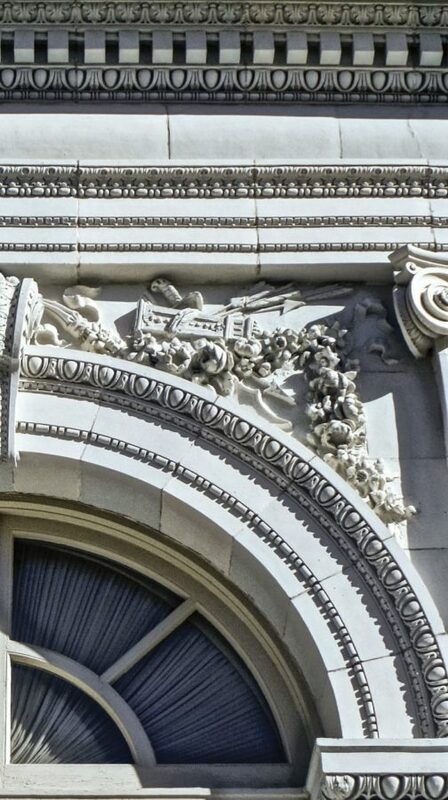 The exuberantly shaped moldings along the window lintel and roofline in this photograph illustrate the elaborate ornament created by new industrial technologies. Although originating in temples, the classical molding influenced domestic interiors as well. During the 17th and 18th centuries, the creation of bolection molding by English craftsman revolutionized the look of rooms at home and in the colonies. These raised moldings, based on the classical S shaped cyma reversa and recta types, were used to frame large rectangular wooden panels. Richly carved moldings also enhanced the door frames, window lintels, fireplace mantels and staircases. 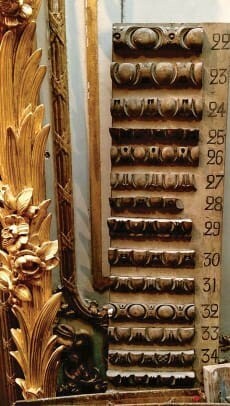 In addition to wood, the primary material used in British and American houses, the French perfected the use of cast plaster moldings to enhance exquisitely carved woodwork, known as “boiseries.” An entire industry arose with studios specializing in interior paneling and its ornamentation. The renowned woodworker Andre-Jacob Roubo published The Art of Joinery (1769) featuring elegantly rendered moldings with mathematical formulae for their precise construction. The refinement of 18th-century moldings gave way to an exaggerated exuberance in the Victorian Age. Cove moldings with deeply curved insets, or comprised of floral sprays and acanthus vines, usually in cast plaster, lent opulence to rooms now focused on the cluttered look of layered decor and complex patterns. With new industrial processes at their fingertips, designers could create many types of moldings with great speed and at relatively low cost. This led to a tendency for excess which eventually prompted early 20th-century Modernists to reject the richness of Victorian interiors. Moldings were considered unnecessary in the new shining white boxes of modernity. The molding, however, did not fade away. Traditional design still relies on these time tested features of architecture now produced in wood, plaster and a variety of synthetic materials. As long as humans create shelter, the molding will remain at their service.